If you are looking for online Black Friday coupons for Avon, you have come to the right place. The Black Friday 2014 sale ads are going to be amazing! Why fight the crowds at midnight? Enjoy shopping from home with online Black Friday coupons. With the many Avon Black Friday deals and free shipping codes, most of my Avon customers will shop from their smart phones and iPhone. Avon will be adding some unbelievable Avon Black Friday deals throughout the weekend. I have listed the current online Black Friday coupons from Avon. However, check back often as Avon will launch new deals often. 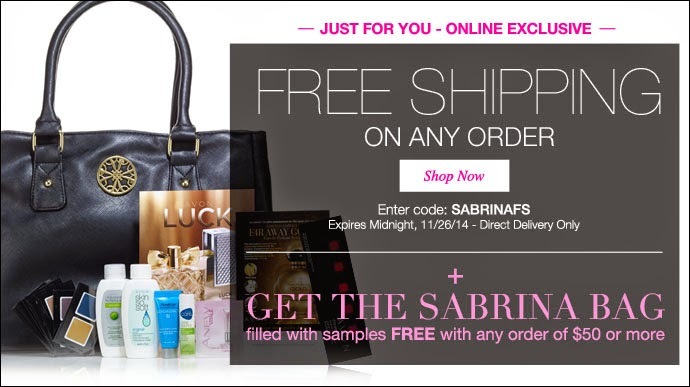 With a $50 online Avon order get this Sabrina Bag free packed full of Avon samples and minis. Avon Online Black Friday Discount: RMNGIFT20 20% Avon Discount on $50 orders. Expires 11/26/14. Avon Online Black Friday Coupon: TY20DIS11 20% Avon Discount on $50 orders. Expires 12/5/2014. Avon Online Black Friday Coupon: Q4WEL14 10% Avon Discount on $40 orders. Expires 1/5/2015. Avon Online Black Friday Coupon: AVONSAVE20 20% Avon Discount on $50 orders. Expiration Unknown. Avon Online Black Friday Coupon: WELCOME 20% Avon Discount on $50 orders. Expiration Unknown. Avon Online Black Friday Coupon: THANKYOU20 20% Avon Discount on $50 orders. Expiration Unknown. This Avon Black Friday ad leak was posted several hours ago. I'm not sure if it is true but let's all wait to see. The online post stated the Avon Black Friday deal is 30% discount on online purchases of $30 or more and free shipping. The Avon Cyber Monday deal is 30% discount on online purchases of $30 or more and a special free gift for $50 or more orders. Of course, there is Avon free shipping on all orders of any size throughout the 2014 Black Friday weekend. Enjoy these online Black Friday coupons from Avon and shop my Avon site at yourAVON.com/mbertsch.